Recently, I felt compelled to write to one of my editors requesting that he stopped sending me discs of organ music to review. It wasn't that I had run out of shelving space - and, anyway, with a probable international move only weeks away I should be trying not to add more stock to the already huge amount which has to be shipped off - but because I felt I had just about had my fill of discs of organ music. For months I seem to have had only negative things to say about the plethora of young and tired (and there's a contradiction) organists who commit their every party piece to disc. While YouTube provides an outlet for the talentless and egotistical meanderings of those in other musical disciplines, organists seem to prefer to embarrass themselves on CD format. So rarely did I find anything positive to say that I began to fear that I had lost my critical powers and was in danger of slipping into that Grumpy Old Man syndrome which affects tired old critics unless they are very careful. As usual, of course, the editor ignored my appeal and has kept sending organ discs by the basketload. However, I am eternally grateful to him for ignoring my appeal, for the latest that's come my way is a truly inspiring disc of Bach. 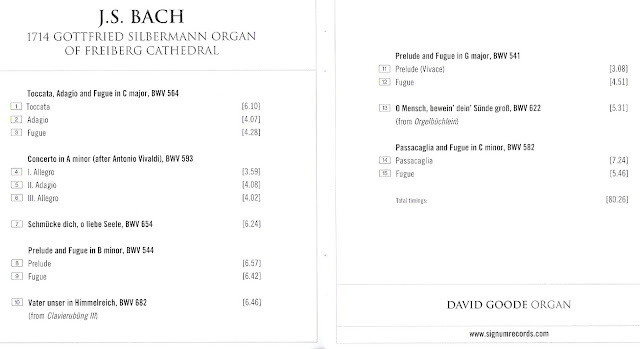 This is what organ discs should be; great music intelligently interpreted by someone who, while not trying to be clever or original, sees Bach as a living, breathing organism and is quite comfortable employing phrasing, ornamentation, tempi and dramatic gestures which might not always accord with more scholarly ideas of authentic Bach interpretation. Blow them, I say! This is Bach how I like it – colourful, interesting, absorbing and, most of all, entertaining. 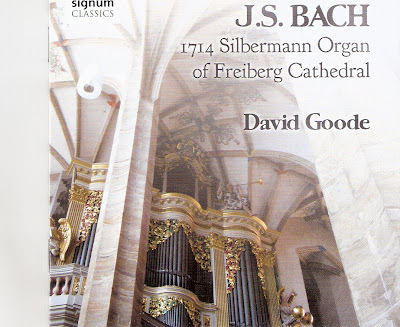 On top of that David Goode is playing on a truly magnificent organ built by Gottfried Silbermann between 1711 and 1714 in the Freiberg Cathedral. And it makes a sound which I can only describe as ravishing. It might look ravishing too, but the Signum Classics photographer has clearly been unable to find a decent angle and all we get in the slim booklet are some oblique shots of pipes and stop-knobs. Who cares? Music is all about listening and this disc - stunningly recorded, I should add - offers a feast for ears and a wonderfully re-invigorating experience for those of us who had just about given up hope of ever hearing a really good organ CD again.